OK. I confess. I’m not single, I’m a carnivore, and my husband is always trying to convert me to veganism, or at least give it a Girl Scout try. I’m the classic Irish Potato head, and if I had my way I’d be eating hamburgers and corn beef hash behind his back. So, being married is definitely not all it’s cracked up to be girls. If you’re Catholic and married or Jewish and married, there’s a ton of guilt that could even result in your confessing, “Oh, I feel so guilty that I ate that”. It may be only slightly exaggerating to say that I feel guilty that I’m not a more “healthy” eater because I talk about health all the time and shine the light on others who actually…are the ones I wish I could be like. 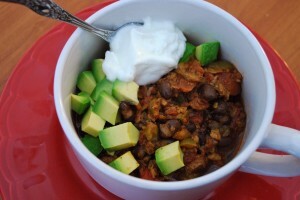 So, it’s with some irony and satire that I post this wonderful Vegetarian Chili … seriously, its great even if you’d rather have a steak! You will love this recipe even if you’re idea of a good dinner starts and ends with steak, veal or chicken. The portobello mushrooms are better than meat, and better for you. If you’re trying to just feel better about what you eat, start your week off with a big pot of this chil..it will last all week and taste good even after Friday’s lunch. Yum, just finished it today. The spices really make it too. Reduce the heat to medium-low and simmer stirring occasionally for about 20 minutes.